We’re never quite prepared for loss. Stumbling through a haze of pain and confusion, Glenis began to record her daily thoughts in a journal after Gary’s funeral, to try to bring some order back into her life. Although she had a loving and supportive family, Glenis knew that her grief journey was hers alone. Through her journal, Glenis was able to document her myriad emotions – often just too difficult to share with others – but “our journal will always listen”. Maybe I could help others walk this agonising path? Towards the end of 2016 – eleven years since Gary’s death – Glenis was asked if she would share her notes documenting her journey through loss. Maybe they could offer hope to others experiencing the despair and desolation she had known. 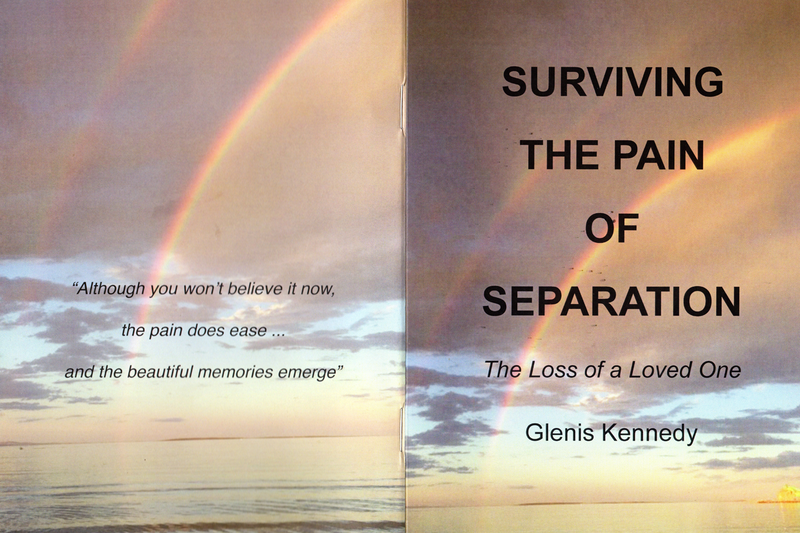 Drawing on excerpts from her personal journal, Glenis’ booklet “Surviving the Pain of Separation” was printed in January 2017. “time and time again I had to cling to the hope that if other people had survived, there would be a way I could also. Often, that hope was all I had”. Glenis’ book isn’t lengthy. Size matters for those who mourn – it’s just too hard to wade through lengthy narratives. There are chapters detailing ways Glenis began to slowly rebuild her life. For example, developing a project was important. Prior to Gary’s illness, a long list of home renovations had been planned. They’d all been shelved. Weeks after Gary’s death, as Glenis faced the ongoing question of “what is life for me now?” she wrote in her journal “today I rang to follow up replacing the shower screen”. Change had begun. Slowly, through her sadness, Glenis realised she had a choice. She could either dwell on her despair – or choose to be happy, to live fully, in the present. She resumed her love of travel, even exploring Paris alone. Now, rather than trying to escape pain, she recognised “I am indeed running towards life”. “Although you won’t believe it now, the pain does ease… and the beautiful memories emerge”. Copies of “Surviving the Pain of Separation” can be obtained from Glenis, at Post Office Box 324, Port Lincoln 5606. There is a cost of $10.00 for the booklet, towards printing costs. Alternatively, you may obtain a copy from West Coast Funerals.